Hello! Welcome to day 3 of Taylored Expressions October Sneak Peeks! We are releasing 26 new dies, 13 stamp sets, 3 embossing folders, 1 cutting plate, a new 6x6 paper pack and 2 new cardstock colors! All products will be released tomorrow @ 7 AM PST. First up is a set of cards for my Project Life album. I wanted to get a head start on my December Daily album, and I'm planning on using these as filler cards. I used You've Been Framed - Christmas and Ice Border to decorate these (the base was created using Pockets & Pages 3x4 Essentials. Here's a look at the individual cards. There are 4 different dies included in You've Been Framed - Christmas. First up is the snowflake. I die cut this twice, once out of Salt Water Taffy and once out of Sugar Cube, cut out just the frame out of Sugar Cube, layered over and stitched. I also added some tiny gems to the center of both snowflakes. 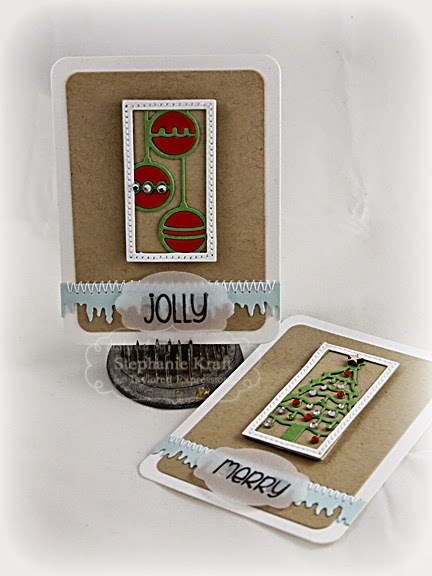 The sentiments (from Little Bits Christmas) were stamped onto vellum and adhered with clear foam tape. For my next two projects, I used the Mitten Garland. This can be used to make a fun garland to hang over a fireplace (which I plan to do soon). This time, I made a couple of gift card holders. The first one is made out of paper. 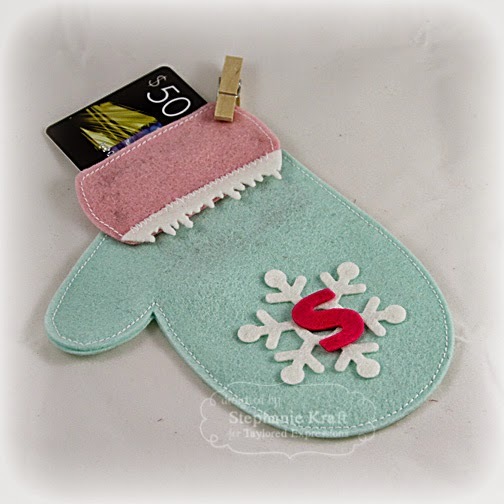 I used the mitten pattern from Gingerbread Lane 6x6 paper pack, Sugar Cube (embossed with the Snowfall Embossing Folder), and a snowflake cut out of Strawberry Milkshake. Gingerbread Lane sequins were added to the center of the snowflake. 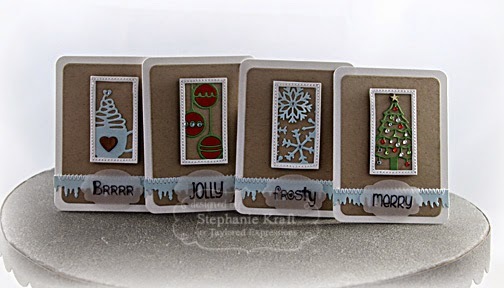 All of these dies come with the Mitten Garland (mitten, cuff, snowflake and "be merry"). My next mitten was made for Sabrina out of felt. I used Aqua Mist, Cherry Blossom, Lip Gloss and Marshmallow felt. I added a little border to the cuff using the Ice Border. And to personalize it for Sabrina, I added the "S" using the Chunky Alpha. Accessories: Ice Border, You’ve Been Framed Christmas, Pockets & Pages 3x4 Essentials (TE); Wood veneer star, heart (Studio Calico), Rhinestones, Clear foam squares, Foam tape, Thread, Sewing machine. Accessories: Taylored Dies: Mitten Garland; Snowfall Embossing Folder, Gingerbread Lane Sequins (TE), Foam tape, Thread, Sewing machine. Accessories: Taylored Dies: Mitten Garland, Ice Border, Chunky Alpha; Felt: Aqua Mist, Cherry Blossom, Lip Gloss, Marshmallow (TE); Thread, Sewing machine. 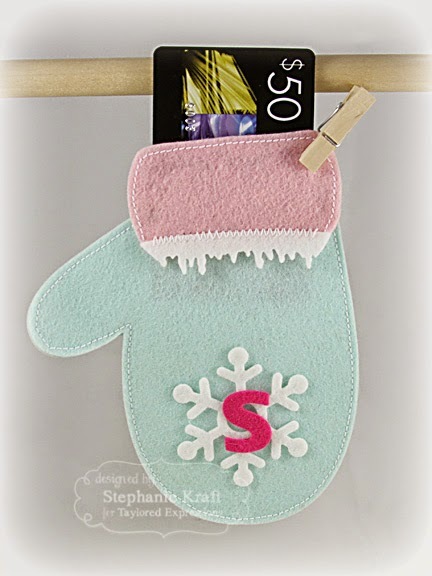 What cute little gift cards, Stephanie....love how you used those adorable little dies and your mitten gift card holders are fabulous!!! Love the framed out cards!! Sweet!! Darling mittens, too! 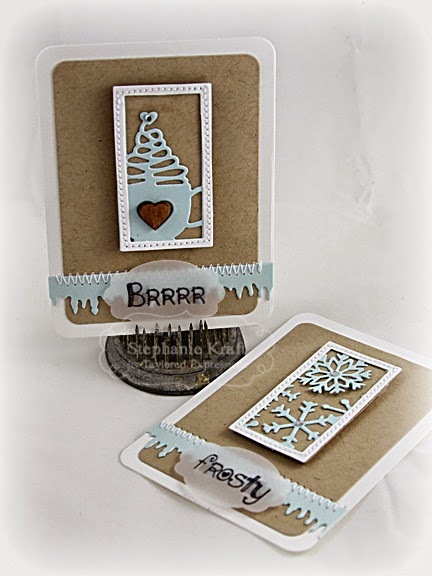 Super cute set of cards Stephanie! 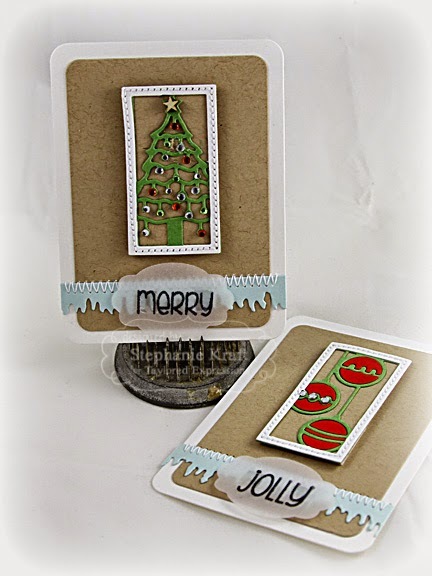 Love all the die cut shapes!